From the street, Adelaide restaurant Osteria Oggi looks small; the kind of place you might take an aperitivo. But step inside and the long concrete bar beckons you onward until you spill into a generous naturally lit Tuscan piazza topped with a verdant hanging produce garden. Oggi is young architectural practice Studio-Gram’s most polished creation. 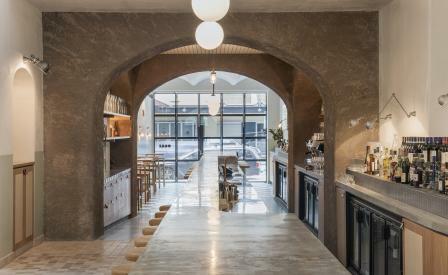 Here, Gram duo Graham Charbonneau and Dave Bickmore have created a sophisticated space that captures the essence of an Italian town square without ever straying into pastiche. Clever touches include signage by Hermés collaborator Tristan Kerr, who has avoided a uniform typographic approach to better reflect an Italian streetscape. The meat room plays the roll of town butcher shop, the pasta-making area the pastificio. It’s post-war Italy crafted entirely from American oak. Oggi - translating as ‘today’ - reflects chef Andy Davies’ modern dishes. Treat your tastebuds to house-made pasta as well as cured swordfish, blue swimmer crab tagliatelle and fried lardo ‘soldiers’. If you arrive early, they have a great selection of aperitivi at the bar. Saluti!